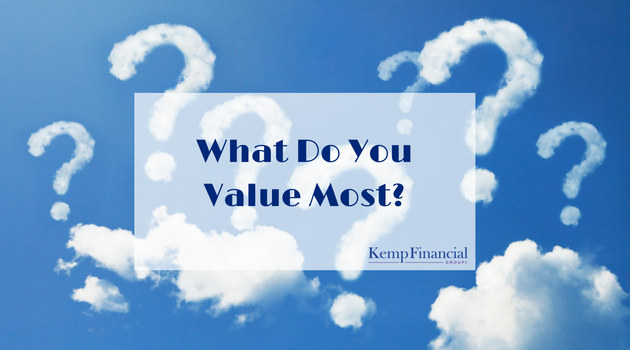 Kemp Financial | Elements of Value: What Do You Value Most? 17 Sep Elements of Value: What Do You Value Most? The evolution and roll-out of the Client Relationship Model, including phase 2 (CRM2), has put an unprecedented focus on the value advisors offer their clients. While there are many resources that focus on the importance of generating value in this time of increased fee and pricing transparency, very few of them provide insight into the meaning and importance of value in the eyes of the consumer as well as how successful businesses leverage this information. What consumers truly value, can be difficult to pin down and psychologically complicated. How can advisors actively manage value or devise way to deliver more of it? This article, published in the September issue of the Harvard Business Review titled ‘The Elements of Value’ highlights the fundamental elements of value that address four kinds of needs: functional, emotional, life changing, and social impact. This model traces its conceptual roots to the psychologist Abraham Maslow’s “Hierarchy of Needs,” in 1943, which argued that human actions arise from an innate desire to fulfill needs ranging from the very basic (security, warmth, food) to the complex (self-esteem, altruism). Which Elements of Value Are Most Important? At the bottom of the pyramid are physiological and safety needs, and at the top are self actualization and self- transcendence. The assumption has been that people cannot attain the needs at the top until they have met the ones below. 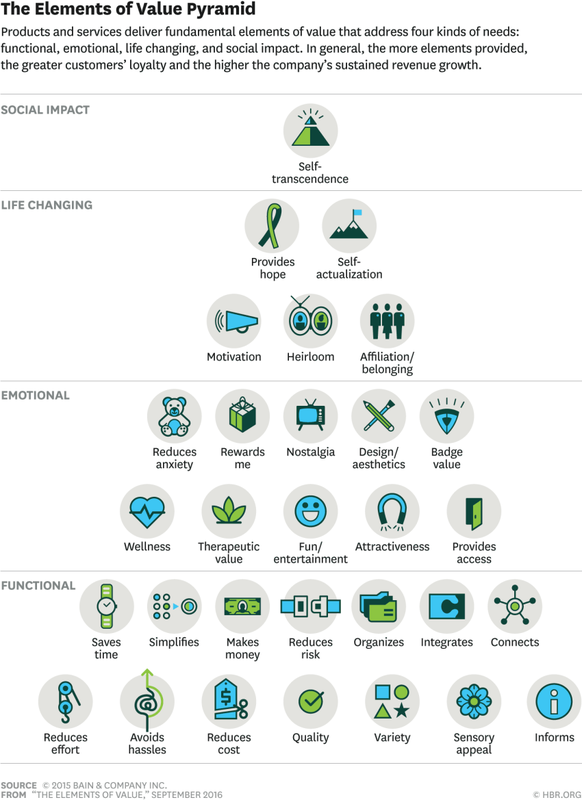 Similarly, the elements of value pyramid is a heuristic model— practical rather than theoretically perfect— in which the most powerful forms of value live at the top. This model extends the insights of Maslow’s hierarchy of needs by focusing on people as consumers– describing their behaviour as it relates to products and services. To be able to deliver on the high ordered elements, a company must provide at least some of the functional elements required by a particular product category. In order to help companies think about managing the value side of the equation more directly, the article discusses how the elements translate to successful business performance. Are some elements more important than others? Do companies have to compete at or near the top of the pyramid to be successful? Or can they succeed by excelling on functional elements alone? What Elements Do You Value? Across all industries, perceived quality affects customer advocacy more than any other element. Products and services must attain a certain minimum level, and no other elements can make up for a significant shortfall in this category. After quality, the critical elements depend on the industry. In consumer banking, provides access and heirloom (a good investment for future generations) are the elements that matter. At Kemp Financial Group, we provide sound financial advice and expert financial services that will help grow, protect and transition your wealth in the most tax efficient way possible from one generation to next. To us, family is the most important thing in the world, which is why we have built a family business focused on helping your family business achieve their goals. Not just financial goals, we focus on enhancing your communication, growing your relationships, and leaving a legacy to help create a strong family foundation.